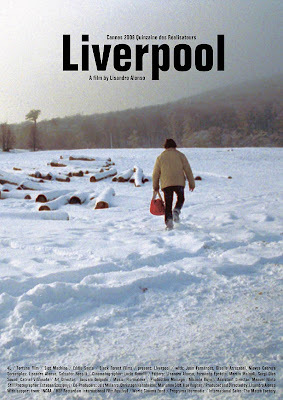 Balancing on the precipice between the art house film and observational avant-garde experiments, Lisandro Alonso’s Liverpool seems to fit in these widespread traditions and still manages to find a space of its own. 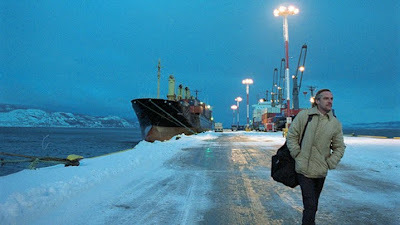 If Los Muertos is an older conceptual cousin to The Limits of Control, as I proposed earlier this week, Liverpool feels like a strange mixture of Peter Hutton’s At Sea and Gus Van Sant’s Last Days – at once slow and difficult, but also viscerally absorbing and, strangely enough, intellectually modest. The balance between the worlds and methods that are in play throughout a long 84 minutes underscore a dialectic that Alonso is constantly working through. Liverpool challenges itself, and the audience, with finding new spaces for fulfillment – a space somewhere between home and the sea, art house and avant garde, simplicity and complication, acceptance and denial, persistence and reciprocation – and it succeeds. Although its formalism may still be challenging and inaccessible to some, Liverpool’s purpose, similar in fashion to Hutton and Van Sant’s films, is hard to miss and more familiar than most give them credit for. Each film can be “explained” with short statements or ideas (the life and times of a ship, the brief life of a trapped rock legend, the life of a lonely seaman) that have been key to a wide array of successful movies. But, of course, the formalism is what makes all of these films “difficult” and perplexing for audiences desiring classification of an accrued “meaning” behind everything that is seen, heard, and felt. Taking these challenges a step further, Liverpool’s first 82 minutes, which have plenty of beauty on their own, are all arguably a set up for the final shot. The attempts to make short summations of purpose or label Liverpool as a supreme art house film in critical attempts to inform the “intended” audience only end up undercutting Alonso’s continuing attempts to craft a controlled hybrid of difficult simplicity and lucid arduousness which play off of the contradictory relationship between overly modest narratology (a man returning home) and long-take, observational formalism. Liverpool’s ability to nail this delicate balance, illustrated by the incredible pay off of that final shot – perhaps the only shot in the film with much dramatic impetus behind it – is a major accomplishment for the continuing development of Alonso’s work as an artist. In discussion of the final shot in his 5-star review, Keith Uhlich writes, “Like everything else in this enigmatic masterpiece, the image resonates with myriad metaphorical possibilities. Yet the more we look, the harder its meanings are to pin down.” Just as the Liverpool ends and a clarification process begins to take shape, Alonso opens up the possibilities further, deepening the impact with something that is beautiful, direct, and simple yet bewildering, stirring, and thoughtful. Liverpool is Alonso’s finest achievement to date. NYFF 2009: What's Up, Docs? Harmony Korine's "Trash Humpers" Trailer?